So one of 3 done. I think I´m going to get me a PCF8574 and will give it a try by myself. Adafruit used another port expander in their I2C display shield called MCP23017-E/SP, it simply offers more ports than the PCF8574. And would make it possible to connect more keys and/or mosfets etc. to switch another appliances like fans or lights. And that´s what I´m looking forward to. Btw: Kann es sein das sich in diesem Thread aktuell nur Deutsche unterhalten? Edited 1 time(s). Last edit at 10/14/2012 09:13AM by Chopper925. Here is the first schematic of my I2C display with buttons. The adress can be configured via a jumper. Edited 1 time(s). Last edit at 10/14/2012 01:41PM by peter6960. Meh, just realized that my lovely Atmega644 has not enough flash for a display with keys, but for a bigger chip I would have to make a completely new layout und new PCBs. 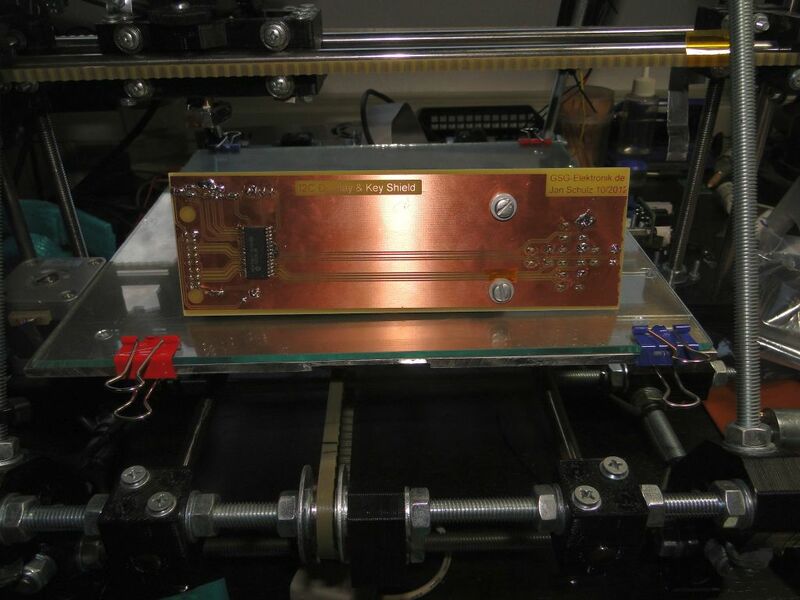 No you wouldn't: Note the title of this post: Gen 7 - standard Traumflaug PCB in use, just upped to a 1284 atmega. Drop-in replacement. Oh, I´m not using a Gen 7 electronic. I´ve designed around march last year my own design, based on the Gen 6 and the sanguino. Just shortly after I finished my layout and it started working properly, all the other neat gadgets, like SD cards and rotary encoders, popped up. And now I´m very busy with my studies and have no time/motivation to layout another one with all the neat stuff integrated. Edit: Sorry, I´ve misunderstood your post. You´re right that there is a pin compatible Atmega1284, I had in mind that this controller is only available in another package, but it´s also available in TQFP44. Yeah, now I just have to get an 1284 in SMD for a reasonable price. Edited 1 time(s). Last edit at 10/15/2012 02:04PM by Chopper925. @mcp: That´s a bit awkward, I don´t think that the software could do something like that. Got finished with the layout, hope that I can find a chance to etch and test it this week. 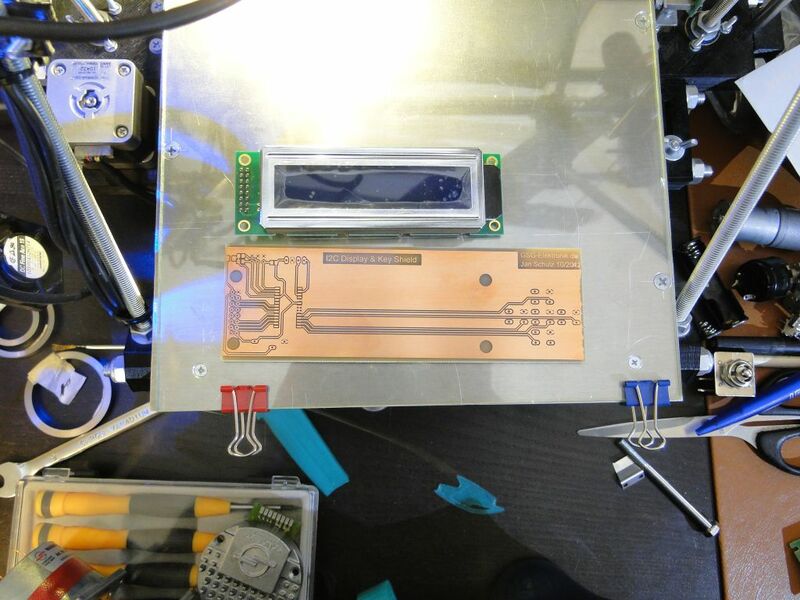 Physical dimensions are 160x50mm, the I2C adress can be set via jumpers. I tried afterwards without connection the heated bed and the Repetier-Host was able to switch the FET on, but was not able to turn it off again. I will give it some testing later on today. So if you are going to connect SD-Card I would be more careful at the moment. I still don´t think that it was the software. 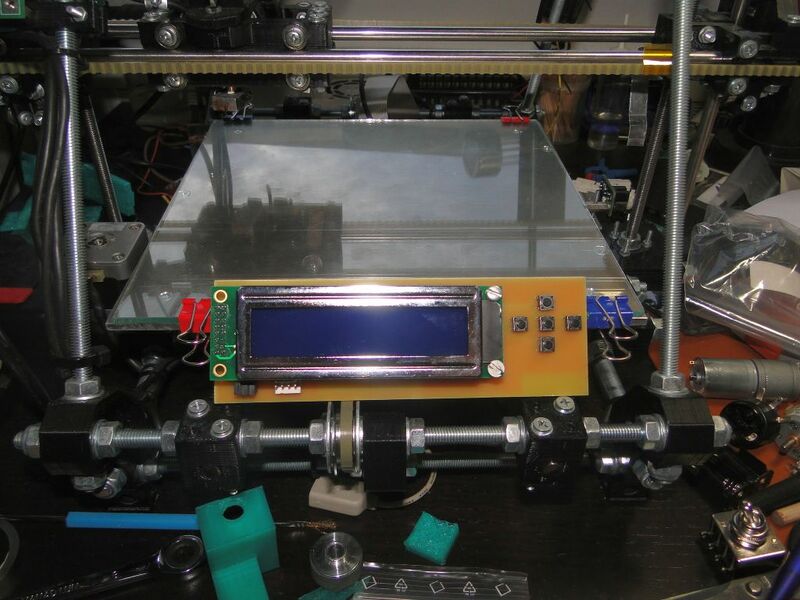 One con of all RepRap-electronics is, that they don´t use any mosfet drivers. With only 5V on it´s gate a normal FET isn´t fully open and with your SD-card and the display connected, maybe your 5V broke down and the FET got stuck in between open and closed. So, ckeck your 5V if they broke down and in the future you should use a logic-level-fet, because they get switched fully open by 5V levels. I'll test next weekend what was going on. Found some time this evening, I´ve got the PCB etched, the remaining parts are on their way to me. Watch out for high frequency switching of the MOSFET. Having it turned on constantly doesn't heat it significantly. Assembled the PCB with LCD, I will try to get it working this evening. Edited 1 time(s). Last edit at 10/19/2012 03:30AM by peter6960. Just waiting for the silly season to be over so RS reopens their doors for me to go pickup some more SD card holders and more ATmega1284s then I am switching over my rack-of-repraps to use this exclusively for Hostless Printing! Edited 5 time(s). Last edit at 12/30/2012 11:46AM by peter6960. please update to this version? What stops you from doing this? Cool! Did you consider Hirose DM3D-SF? Similar design, slightly cheaper. I would be interested in a LCD+encoder panel for use on my Sango-bc. I can have a go at adding some LCD support to Teacup if anyone is interested. Registered on wiki today so I can update the links, thank Traumflug! I can have a go at adding some LCD support to Teacup if anyone is interested. I am testing some LCD and Encoder routines in TeeCup Fimware. At moment LCD and Encoder works. But some sourcecode need final finish... next i need a menü struct with useful things. SD follows... Otherwise some working LCD, EC or SD works in TeeCup? Repetier helped me sort out all the SD issues, so late last night I re-layout all the boards... Tonight etching and final integration testing! Otherwise some working LCD, EC or SD works in TeeCup? There's an "sdcard" branch in Teacup. Not sure about it's current state, judging by the commit comments it was basically working at some time. In case it's basically working and wrapped in #ifdef SDCARD_PIN, it can go into the Gen7/master branch. Hehe, no despite the resemblece to Afrikaans, it still requires a paste in Google Translate sometimes.. If anyone can help shed light - last obstacle before Hostless Gen 7 Printing all with single sided hardware! FTW!